Not so long ago, it seemed that memory manufacturers were assuring us that the move away from spinning hard disks would herald a new momentous, Golden Age of Peace and Prosperity on Earth – and then possibly the Whole Universe. Then came the MacBook Air and Asus' EeePC, whose poor performing solid state drives were the weakest part of otherwise superlative products. Mere months passed before the global depression set in. Coincidence? We'll never know. As far as we can tell, solid state hard drives haven't quite shaken off the reputation for being overly expensive and not as good as you'd expect. 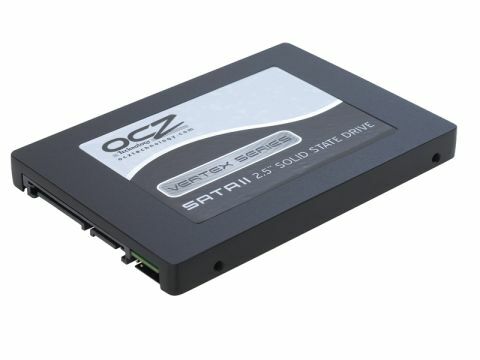 That may explain why OCZ has launched its third series of SSDs in barely a year. This Vertex drive is the highest performing model in its range and is kitted out with a healthy 64MB of cache and a new ARM-based controller. This speciﬁcation should help it overcome some of the bottlenecking problems of earlier drives (from all manufacturers). As we've found with many SSDs, a lot of the theoretical benchmarks that we've traditionally used to measure drive performance are good, but don't seem overly impressive. That's okay though, because the real world tests irrefutably establish the superiority of solid storage right where you'd expect it. Compared to one of Seagate's high performing 1TB traditional drives, the Vertex shaved a good third off of Windows Vista's boot times, and a similar amount from level loading delays. We only had a single sample in for review, but we'd love to repeat our tests with two or three of these in a RAID array - we're sure we'd see some outlandish scores. If you're thinking of using one of these 2.5inch demons in a laptop, you'll also beneﬁt from low power consumption (2W at peak) and full shock resistance. Vertex, then is the SSD which we want in our own rigs. Except that when you look at the price tag it's clear even if the technology has been mastered, we're still in the ﬁnancial dark ages of ﬂash storage. Just as we were starting to see some similarly sized competitors slip below the £150 barrier, OCZ comes along and re-establishes what it means to be premium. Per gigabyte, it's over 30 times more expensive than a standard hard drive – which is a hell of a lot for what amounts to 30 per cent in improved performance. You can't get away with buying a cheaper 30GB model just for booting off of either: the smaller drives aren't quite as swift as their larger counterparts. This, then, is the drive you should aspire to own, but it'll probably be a few years until you afford it.